Choosing a stroller for your little one can be very confusing. There are so many options to consider. Are you going to be jogging with it? Do you need a car seat to fit inside it? How compact do you need it to be? It can be a little overwhelming for new parents. I remember when we were registering for our baby shower and we weren’t sure what to do. We ended up registering for a travel system with a very large stroller. We ended up getting an umbrella stroller later because the stroller was too large for everyday use. Choose your own path with the Eddie Bauer Trail Hiker 3-Wheel Travel System. The 3-wheel design provides superior maneuverability around tight corners that will get you and your little adventurer around easily. 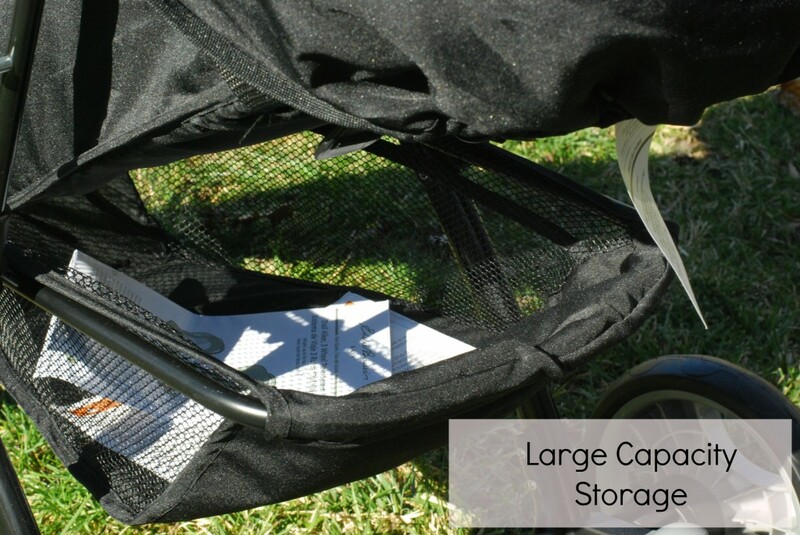 This travel system also features our Top Rated infant car seat with Side Impact Protection and an extended use range of 4-35 pounds for a safer and more comfortable ride, whether in your car or attached to the stroller for a walk in the great outdoors. I will start at the beginning. The system is a breeze to set up. My husband has done a lot of putting together in the past few years and he told me this was by far the easiest product that I have reviewed that needed to be assembled. Really all he did was attach the wheels. 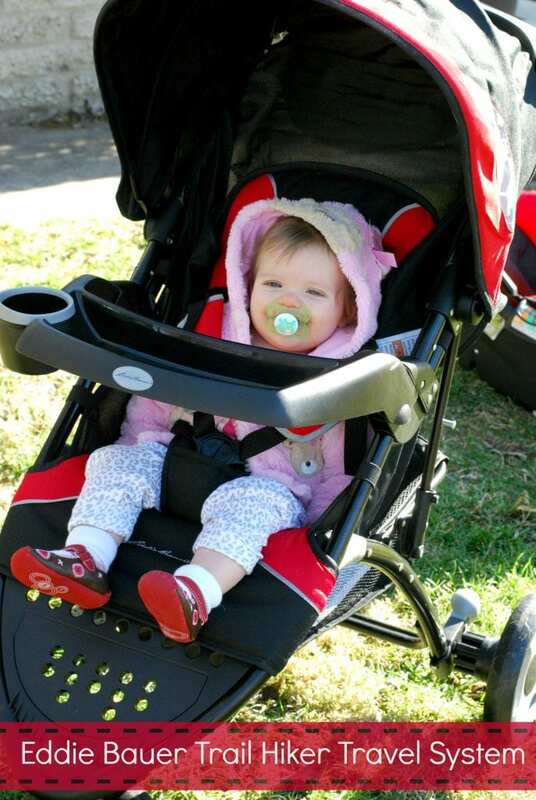 As you can see from the picture above, the stroller can fold up into a very small stroller, thus making it easy to fit into small vehicles. Another feature I love is the adjustable handle. It will actually telescope out a little for those of us who may be a little taller than the average Joe. If you are a very tall person, you will be thankful for this option! I love how large the under basket is. While it is not enormous (which helps when it folds up) it gets the job done and holds everything that I need it to hold. The system is very sleek looking. I appreciate the clean lines and the bold colors. If I had a magic wand, I would have told Eddie Bauer to also offer it in a bold purple or pink for all those little girls out there. While red can work for either a boy or girl, this is my last baby and I would love to flaunt her girlie style. The car seat is extremely lightweight compared to our old system. I wish we had this earlier. I never realized how heavy these infant seats are until I forgot my stroller and had to lug Caroline in her infant seat through the mall. 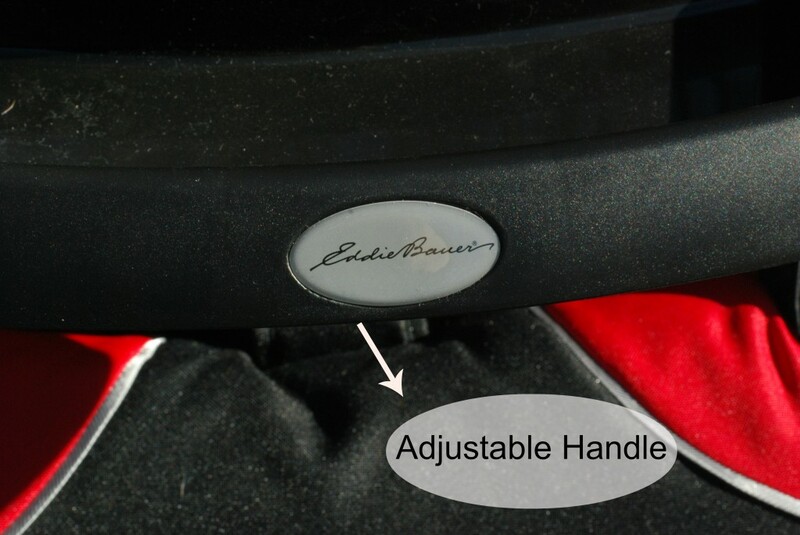 The infant seat base installs easily and quickly into the car. Really the only complaint that I have with the system are the straps on the stroller itself. 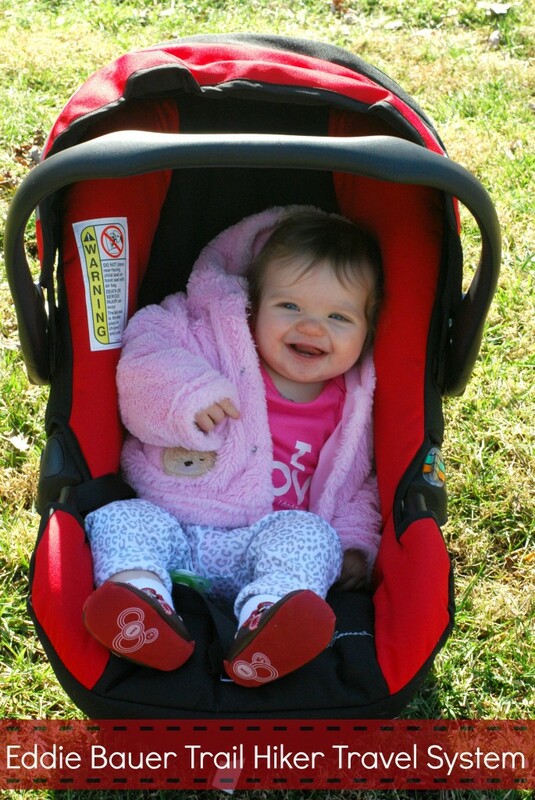 The first time I put Caroline in the stroller, I had a hard time getting the straps apart and connected again. I can say that this gets easier every time you do it, but the first time was a little difficult and I have a lot of experience with these types of harnesses. Overall, I love this system. We have replaced our old one and will never look back. I will be excited once winter is done and we can get out and do a little more hiking. I can’t wait to see what this baby can do on the trails! 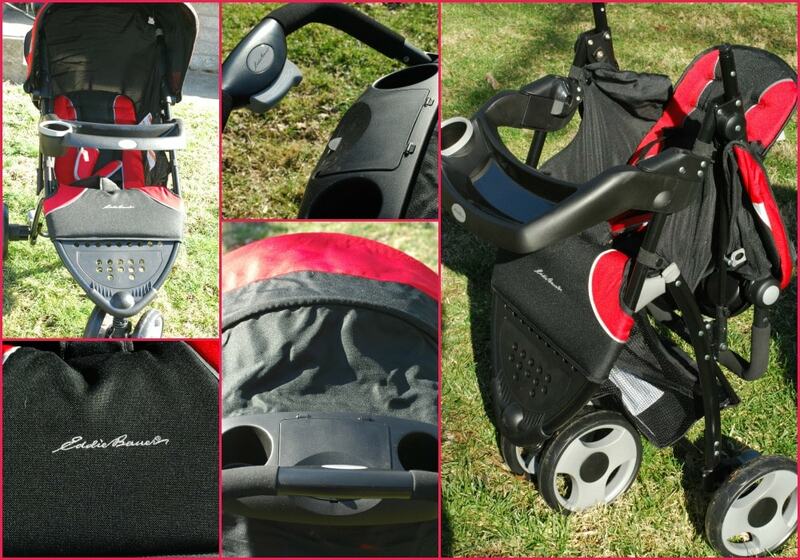 One (1) lucky reader is going to win their own Eddie Bauer Trail Hiker 3- Wheel Travel System, ARV $249.99! A huge thank you to Eddie Bauer who has provided me with the featured product for this review, I didn’t receive any compensation for writing this article. All opinions are 100% mine! This looks great! I would love to have this in the limeade color. I am loving that gray green combo! I like the red and black one. i love the red ! The green and gray combo is the sleekest looking one! Thank you. I think I like the red best too. I like the black and red colors! I like the grey color! I would choose the grey/green color! I would choose the limeade. I’m thinking black might make it too hot in the sun. I’d go with gray and a bright shade of green. I’m expecting my first grandchild so if I could pick I’d like something gender neutral. I’m expecting my first grandchild so if I could pick I’d choose a something gender neutral. Gray (because it is not as hot as black) and a bright green please! Grey because it’s gender neutral, and we don’t know the gender yet. I would love to have this in the limeade color for my new baby. I like the red like yours. Great stroller! Oh I love the red and black! Luv the black and red. I’d love to have this in grey!